This necklace has 3 unique diamonds that interplay with color and scintillation. One rose cut 1.03 carat diamond with D color and SI1 clarity, one rose cut 1.39 carat diamond with E color and VS1 clarity, and one 0.04 carat round brilliant cut natural fancy pink diamond bezel set in a rich 18 K rose center of this incredible bow-tie shape finish the look. 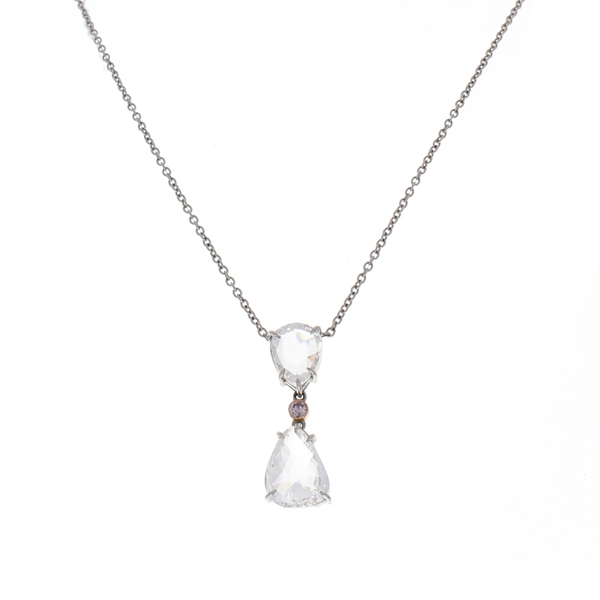 This lavish three-stone diamond necklace is connected to a glossy 18 inch long cable link chain, allowing it to lay gracefully on the collarbone when worn. Accompanied by 2 GIA certifications upon purchase.